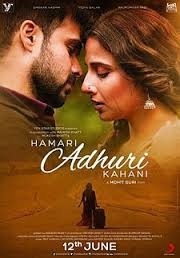 aur Shauhar paanch mein (implies Mohit Suri @ Humari Adhuri Kahani). No tongue in cheek this matter is, lekin Love has many shades to it. HAK is the newest hue. Claimed to be loosely based on a homebred story from Bhatt factory, basic plot of the movie breathes Bhatt’s sensitivity into the ever intriguing matters of heart. Aarav (Imran has-me-swooning like never before) is an intense, workaholic Hotelier (read Tycoon), with no house to live. Seat 1A on air is the most permanent address of this rich nomad. Enters the beautiful (read Non-dirty) earthy, married Vasudha (aka Vidya), with her own myriads of relationship issues. When Aarav meets Vasudha, he realizes that home is where the heart is, and stretches commitedly into Vasudha’s Dil. Shagufta Rafiq and Mahesh Bhatt give intense alfaaz and do perfect justice to ignite the fire between the two, when Vasudha passionately says, “Teach me to Love” and fills an aroma of belongingness in the nizaam-e-aalam. Just few pristine moments of lovehearts’ tales, preceded and succeeded by a matrix of iska problem and uska problem. Aarav’s hurtful past and Vasudha’s present results in a concoction of pain and miseries for the characters and audience alike. The story line slips out of context. Director Mohit (Suri) tries to convince us in vain, that a rich, powerful, impressive and love-charged guy Aarav is unable to bring his love story to its completion. But the song tracks are hauntingly addictive and heartening. Hence, an EXIT Review. The movies is almost on its way out. To see, or not to see, is not the question anymore !